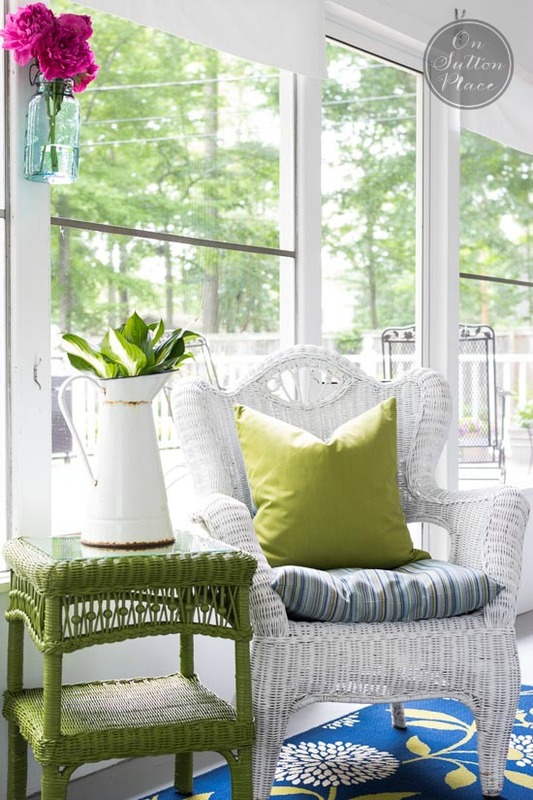 5 Summer Porch Decor Ideas that will add a cozy feeling to your outdoor space, and make it function like an indoor space. Welcome, once again, to my back porch…and a very special welcome to the first ever bHome Summer Open House! 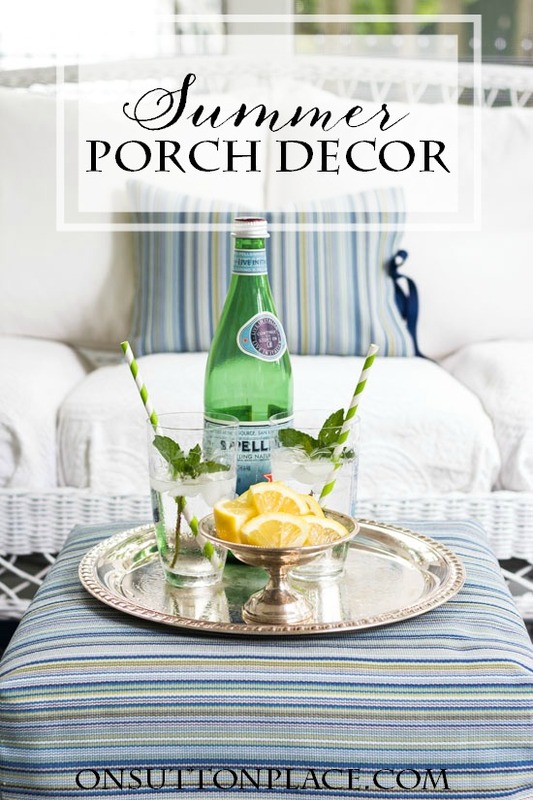 I’m sharing 5 summer porch decor ideas and then at the end, I’ll be linking to a few other talented bloggers who are posting their summer homes too. There are four of us today and the line-up for the rest of the week is incredible. I’ll be coming back every day to update the schedule so by the end of the week all the links will be here. 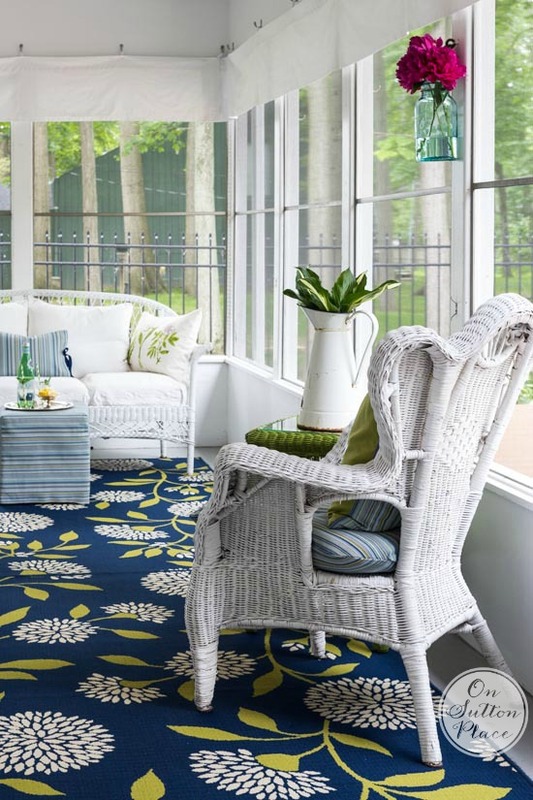 If your porch floor is less than lovely, a good way to make it go away is to add a rug. It should be an outdoor rug for sure because it will definitely get wet. My rugs are about three years old and still look great. I don’t worry about them getting wet because they dry out quickly. In the fall I roll them up and they live on my porch during the winter. 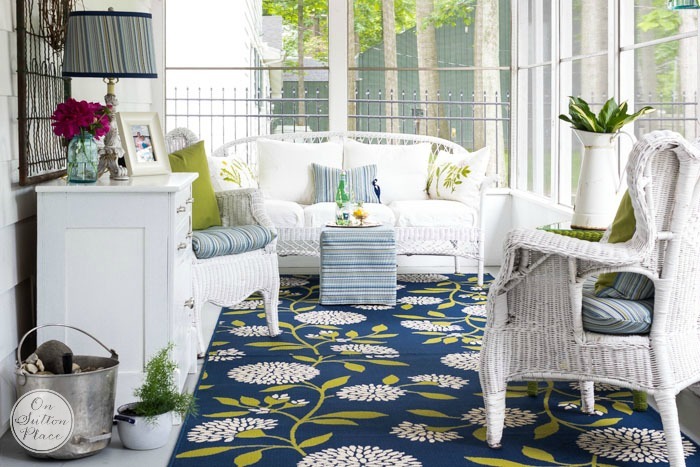 A rug adds a great pop of color and makes an outdoor space cozy. If you plan to spend any time in your outdoor space, comfortable seating is pretty important. If you have hard chairs, a good way to make them more comfy is to add cushions. Even inexpensive plastic stacking chairs would be OK if you added a small cushion…and maybe an ottoman. It’s so nice to put your feet up and really relax. My wicker furniture borders on being classified as vintage. It’s the real deal and needs a coat of spray paint every few years. If you can find weather-proof furniture that’s in your budget, that’s definitely the way to go. One of these days I may splurge and get some myself! If it’s possible, adding fabric to an outdoor space definitely ups the cozy factor. Even if it’s just a few pillows it will make a difference. My porch has only screens so I opted for simple white valances made from washable cotton duck. I sewed ribbon tabs on them and they hang from hooks. It’s an easy alternative to curtain rods. One thing I’ve learned about using fabric outdoors is that it does fade over time. Synthetic outdoor fabric is a great option and it is pretty much weather-proof. One of my favorite times to be on our porch is in the evening. I turn on the lamp and as daylight vanishes, the porch remains lit and snug. If your porch is open with no outlets, solar lighting is a good option. One thing I would also recommend, if possible, is a ceiling fan. In the evening, when even the hottest summer day cools down, a fan makes it possible to still enjoy the porch…especially if there isn’t any breeze. 5.) Fresh flowers and accessories. Fresh flowers and accessories are the finishing touch and will make your outdoor room feel complete. 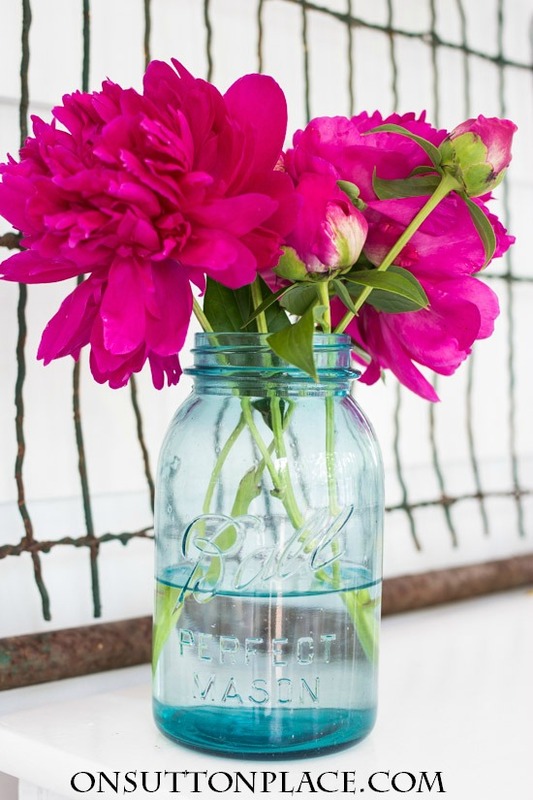 Keep it simple or not…but even just a jar of fresh flowers makes the space feel special. Just recently I made a container water fountain for our porch and I have loved hearing the sound of water. The vintage garden gate is from my daughter’s yard and you can read the story of how it ended up on our porch HERE. I checked sources for the fabrics I used but they are no longer available. Here, one more time, is the link for the rugs. For a bit more information on layering a room click HERE. I hope you have time to visit my bHome friends and take a look at their homes all decked out for summer. There are great ideas and tons of inspiration. We are featuring indoor rooms, outdoor spaces, gardens and more. Thank you for stopping by…I am honored that you chose to spend some time with me today. I love all the greenery you have on your porch. It makes everything seem so relaxing and inviting. Great work. Your porch looks as lovely as the rest of your home, Ann. You have certainly created a warm, inviting and beautiful space. I absolutely love your porch. Pour the lemonade; I’ll be right over! Lol! This porch is just magical. White with pops of saturated color!? I’m in love. Beautiful job Ann! And thanks so much for putting together this amazing tour of beautiful homes. So happy to be a part of it! Always love the fresh colours with the white on your pretty porch. I would love a spot like this. You do such a great job layering all the textures and pieces, Ann. Thanks for the great tour. I could spend a lot of time on this porch! It’s lovely. Ann, your porch tour is gorgeous. I love the tips and will be using this as inspiration on my deck. I love the colours, the rug is so perfect with the white. You always have such great style, thanks for opening your porch to us! I sadly do not have a screen porch, but desperately want one. The home I grew up in had a huge one that we used all throughout the summer, so I have fond memories. When I get one, I hope it is half as gorgeous as yours. Oh, dear friend, what a gorgeous place to work from within your home!!! 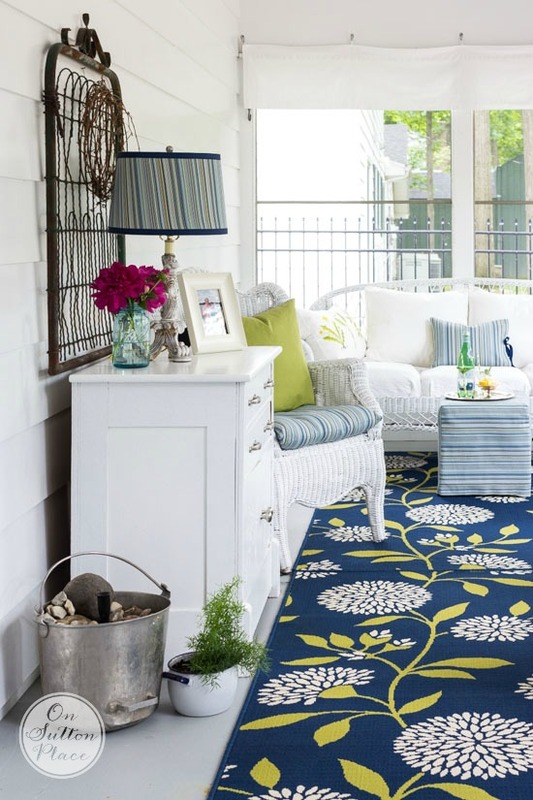 I am absolutely swooning over the impact the rug makes on your porch!!! 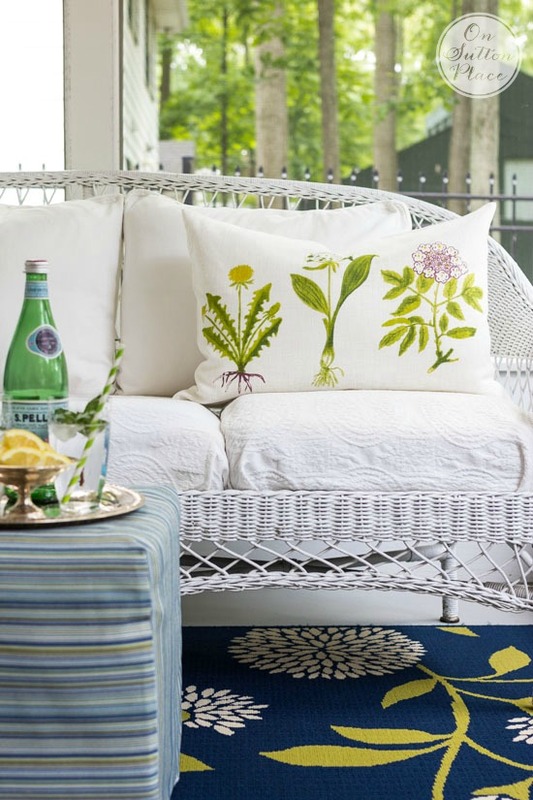 Love the cushion of plants on the wicker settee!!! make this an amazing place to reside in the heat of Summer!!! Thank you for sharing your lovely porch with us as a part of the bHome Summer Open House!!! How Lovely and Welcoming. I would gladly trade in one of my three decks for a screened in porch! Especially with these blood guzzling New England Mosquittos! I love your rug and the entire space, beautiful!! YOU WON THE GIVEAWAY for $200 to Painted Fox Treasures!!!! so I can get your contact info. Yay!!! I adore your porch – so cozy and welcoming! Great pops of color for summer! I love your style and the work that you did on your daughter’s home. Would it be possible to share some landscaping that you and your daughter have done at her house? Hi Francis! I will talk to my daughter and see if she can get me some pics of her landscaping. It’s very simple and was completely DIY but it turned out pretty good. Thanks for your question! my bHome name is Regina. Love your blog. my bHome name is gacgolf. Love reading your blog!! My parents had a screened-in porch on their house, too; and we practically lived out there in the summer. I loved it when the rain was falling, and we could still be ‘outside.’ The house I’m living in now has a beautiful side porch, but it’s small; and there’s not much we can do because of the swing. This article has my mind reeling, and I’m heading out soon to measure for a rug and possibly move an old dresser out there. I always get good ideas from you blog! Thanks. Ann, I do love your porch and that rug… it is just so fresh and lively looking. The whole outdoor room is a treat and must be lovely to work in over summer. Hello from Colorado! My bHome username is mnlunie. Thank you! Ann – your home is bright, fresh, crisp – summer!! Love it! Your porch is so pretty. I love the pops of apple green. That’s my favorite thing about your porch! Love your porch! Do you have any issues with rain coming in? Yes the rain blows in but I don’t worry about it. Everything is weather proof and dries out quickly especially if it’s hot. I also have a ceiling fan that helps with that too. Thank you for stopping by! Ann, your porch is my dream porch. It is just beautiful from top to bottom and all around. I love everything about it. Sure makes our deck and porch look very drab in comparison. Enjoy! Very nice! Beautiful porch! Great job! Love your porch! So cheerful and welcoming!! Your ideas are great not to mention how wonderful your porch seems. I’ll bet there are some great summer times spent there. I’m already a subscriber to bhome and Snipin’Sister is my name. I always enjoy seeing your cute porch, Ann. I love your porch. The pictures look like it’s screened in. my porch isn’t screened in’ but it’s on my list to do. Anxious to learn about bHome! Ann – You are so lucky to have an enclosed porch. It is gorgeous. I would be out there all the time – love it. It looks beautiful Ann, I love the wicker and the pretty color scheme. I love your porch. My “vintage” wicker is falling apart too. I have had the bhome app since the beginning. My user name is broadwde. 3347lakelover is my user name. Love the things you do. And thank you for participating is the home tour. I am coming over with my lap top & we can work together from your porch! Ok, how fun would that be!! Beautiful Ann and so inviting – obviously I invited myself !! I LOVE LOVE LOVE what you did with this porch. I have been wanting to spend more time on my front porch but the bugs really get to me and there is no cover over my patio out back. Seeing the shades around your porch (top and photo 1) gave me an idea of what to do with some sun-shade fabric and left-over grommets I just got. I’m going to sew light weight netting to the bottom (with curtain weights to keep it from blowing away) and use the grommets to hang it around my porch. This should keep the mosquitos and gnats at bay. Great post. Have the app – jodithegirl! 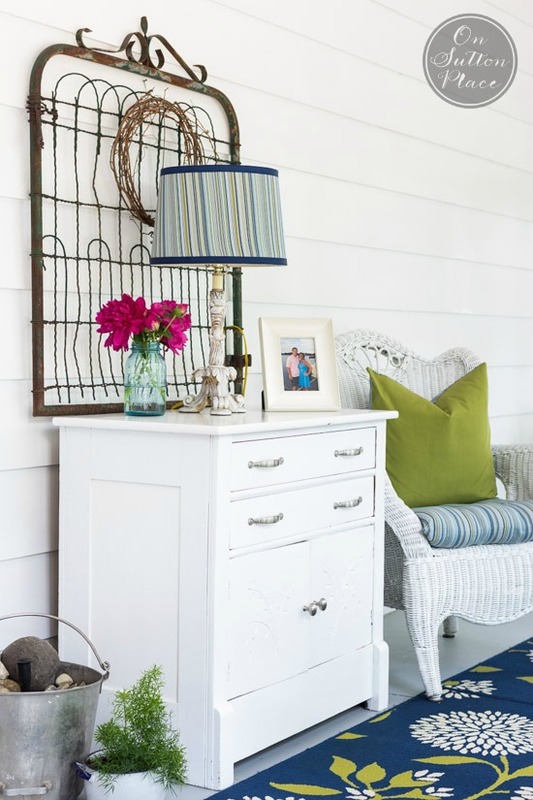 Absolutely love this cheery and inviting back porch – and the rest of your beautiful home! Look forward to receiving all your messages and hopping over to the blog. Excited to be a new member of bhome – user name: 4everspring. I am a recent discoverer of your blog. I LOVE it! My girlfriend and I are about to move in together, and I can’t wait to decorate our home. My house used to be a huge priority in decorating, but the last 6 months, I’ve really let it slide knowing I’m about to sell it and move in with the love of my life! I just signed up for the bHome app. My username is “midlifenatalie”. Thanks so much for such great ideas! Welcome to On Sutton Place and good luck with your new home! I so wish I had a covered/enclosed porch! This back porch is beautiful. I like the mix of fabrics, colors, products, flowers- everything. I love the rug also. What a beautiful porch! I love all the colors you’ve used. It looks so relaxing and comfortable, the perfect place to spend summer! Who would not want to kick back at the end of the day with a cold beverage on your porch! Thanks for sharing. Your porch is just lovely but I have a question concerning the give a way; The android app isn’t out yet so does that mean I cannot enter the contest? Never mind! I just saw the part you mentioned about android users. Hi Ann, I love your porch with it’s beautiful greens and blues and the white backdrop. It looks so inviting and refreshing. Enjoy the week ahead. Love your porch! Just downloaded the bHome app. User name gbc. Wow! Beautiful! I’m so jealous of your enclosed porch…what a lovely sunroom you have created! I really enjoy reading your blogs. I get many grest ideas. You have a natural talent for making things look so pretty. I am in love with the porch, I’m not sure if I would ever leave it. Thank you for sharing. Ann your porch looks wonderful…I would spend all day out there too!! LOVE your vintage wicker pieces! I’ve just downloaded bHome. I was assigned user name 11229. Can I change it to a name of my choice? Thanks for this giveaway. Hi Debra – yes you can change your User name. Pop into settings. If you have any trouble email me at contact@bHome.us Welcome to our bHome family. Hope you don’t mind I popped in here Ann! Hi Debra! Yes you can change out the number. Just go to your profile page and tap the gear in the upper left hand corner. Tap where the number is at the top and the keyboard should appear.Just enter your new user name and tap done. Thank you for joining us at bHome! Did you put 2 rugs together? If so did you use to keep them together since they may get wet. Yes I laid two rugs end to end because the porch is so long and narrow. I leave them in the porch all summer. They are outdoor rugs so they dry out very quickly and really have not even faded. Thanks for stopping by! The rug is gorgeous. It really adds that pop of color. Great article. Thanks ! Wow! So beautiful! I would hang out on that porch all day!! Gorgeous! What a lovely place to spend a summer day! Ann… you always inspire me! I love your tips for making the most of your porch. We have a big porch and since it is our first spring at this house I am just starting to pull things together to maximize the enjoyment of it. 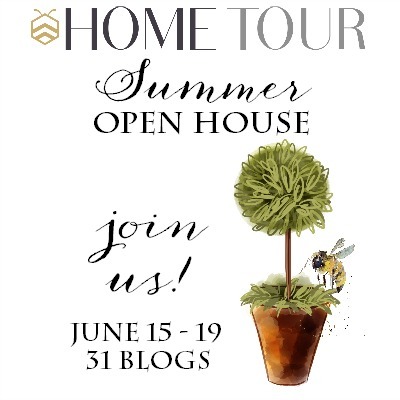 This home tour is wonderful and I am looking forward to my turn on Thursday! Have a fantastic week on your beautiful porch… I picture you sitting, sipping and planning… how perfect! Ann, I always love seeing your gorgeous porch decorated so beautifully for each season…Must say that other than the beautiful fabrics, almost vintage wicker and that gorgeous rug, I have to say that my fav is the gate. I loved reading about the story of it a while ago. Great to party with you and the other members of the wonderful bHome mobile app community. Have a wonderful day!